Served as Hon Secretary from 1967 until 1971. In 1994, she became a member of the Bushey Museum Trust from which she retired in 2015. Michelle P. Brown is Professor of Medieval Manuscript Studies at the School of Advanced Study, University of London. She was previously (1986-2004) Curator of Illuminated Manuscripts at the British Library. She has been a historical consultant and on-screen expert on several radio and television programmes. 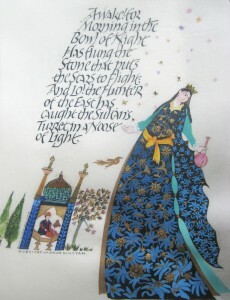 She has published on the Lindisfarne Gospels, the Luttrell Psalter, and the Holkham Bible. Honorary Member. Distinguished bookbinder. Re-bound the Codex Siniaticus for the British Museum. Responsible for Western Manuscripts at Sotheby's"
Curator at the Harvard Library. Librarian and Keeper of Manuscripts of the Walters Art Gallery, Baltimore, Maryland (USA) from 1934 to 1973.As an Honorary Member, Miss Miner gave a Lecture entitled "The Development of Medieval Illumination as related to the Evolution of Book Design" at the Victoria and Albert Museum, in conjunction with the Exhibition "The Decorated Page". (from an obituary presumed published in 1973). Director of the Klingspor Museum. Professor of Graphic Design at the Fachhochschule Wiesbaden (University of Applied Sciences), font designer (Wiesbaden, Germany) Biography Werner Schneider was born in Marburg/Lahn, Germany in 1935. He studied lettering arts under Prof. Friedrich Poppl at the Werkkunstschule Wiesbaden. Later he became a teacher there with a special emphasis on calligraphy and design. He has been a professor of Graphic Design at the Fachhochschule Wiesbaden (University of Applied Sciences) since 1971. He is also a freelance calligrapher and font designer. Schneider deals in corporate, logo, font, and book design. He has been a member of Type Directors Club, New York since 1987. Schneider designed typefaces for Berthold AG Berlin (later Chicago), Schneider Antiqua, Schneider Libretto, Vialog, Sunetta, and Satero. Numerous exhibitions in Europe, the United States of America, Australia, Canada, China, India, Israel, Japan, South Korea and South Africa. Numerous publications in international professional editions. Solo exhibition “Werner-Schneider-Archives of the Academy of Arts, Berlin”. Later on his works were showcased in Victoria and Albert Museum London; Book and Arts Special Collection of The San Francisco Library; Newberry Library Chicago, Musée des Arts de l“Écriture, Paris; Prince of Wales Museum Bombay; Klingspor-Museum Offenbach am Main, etc. Numerous awards from the following institutions: •	“For Typographic Excellence” prize, the Type Directors Club New York, •	the Art Directors Club, New York, •	Merit Award, the First International Exhibition 1987, •	Gold Medal for Schneider-Antiqua from Biennale of Graphic Design Brno-Czechoslovakia, •	Rudo Spemann Prize, Klingspor-Museum, Offenbach am Main, etc. Statement regarding my activities in lettering art It has always been important to me as an artist in the field of lettering to show script in its purest forms. In an age dominated by the computer, a machine that quite frequently distorts script and produces caricatures, I feel a strong obligation to the aesthetic aspects of a cultural asset with a long standing tradition. I feel that classical forms deserve our deepest respect. My work focuses primarily on reaching a high quality both in regard to static as well as dynamic expression. I am also strongly interested in giving language a shape that represents its original content in an adequate and modern form. The fascination I have with rhythm that is such an important aspect of writing done by hand has lead me to design my work close to scriptorial forms. Even though I prefer an expressive and spontaneous approach to lettering, this art form should nevertheless still be accessible to critique and not dissolve in a jungle of shapes. We already have plenty of those and we should not increase their number by adding calligraphic grimaces. Founded the Colleagues of Calligraphy (Minnesota, USA) in 1976, and was a "prime mover" in the project to write the St John's Bible. She is Honorary Curator of the St John's Contemporary Calligraphy Collection. Typeface designer, designer of books, illustrator and teacher. 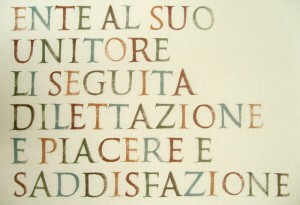 Initiated the lettering course at City and Guilds of London Art School. Hermann Zapf, born in Nuremberg, Germany, in 1918, taught himself calligraphy from the books of Rudolf Koch and Edward Johnston. He had a distinguished career in type design, calligraphy and typography which stretched over fifty years. His Zapfino typeface, originally released in 1998, was an amazing success that has since worked its way into designs produced all around the world. 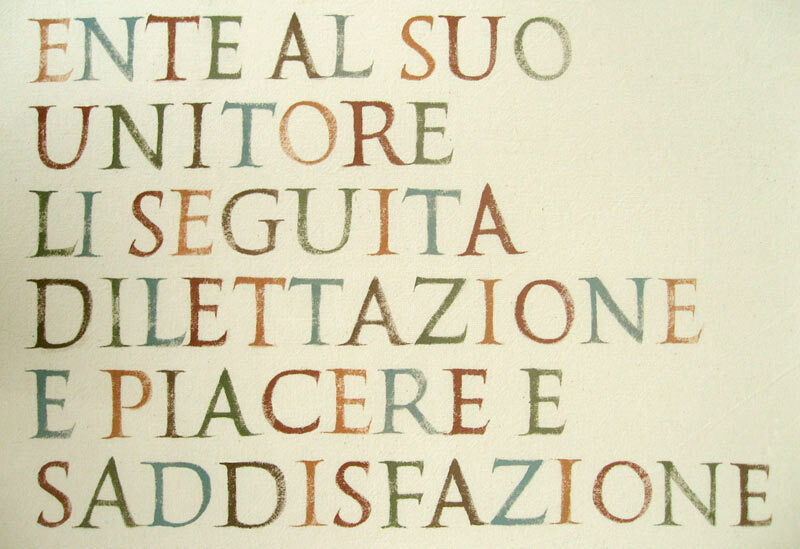 Hermann Zapf was a major international figure and widely recognized as an educator and thinker of significance. He was also a member of the Alliance Graphique Internationale (AGI) and the American Institute of Graphic Arts (AIGA) and was elected as a Royal Designer for Industry in 1985. His early graphic interests lay in calligraphy and the work of Rudolf Koch and Edward Johnston, although he was to become widely known for his contribution to type, working as type director of the Stempel Foundry in Frankfurt from 1947, graphic consultant to the Megenthaler Linotype Company in Brooklyn, New York, from 1957, and vice‐president of Design Processing International in New York from 1977. His best‐known typefaces included Palatino (1950), Optima (1958), ITC Zapf International (1977), and ITC Zapf Chancery (1979), the latter two for the International Typeface Corporation. Other major foundries for which he worked included Linotype and Berthold. He was a prolific author, his books including Manuale Typographicum (volume i, 1954, volume ii, 1968), Typographische Variationen (1963), and Herman Zapf and his Design Philosophy (1987). see http://download.linotype.com/free/howtouse/ZapfBiography.pdf for his short autobiography.